Think of your favorite childhood candy. Pop Rocks? Zots? Sugar Daddy? How about Razzles? A candy store that offers these nostalgic candies also offers up memories of childhood. Almost every Sunday after church, we would stop at the grocery store and purchase some little sweet treat. What excitement to go through the candy isle, and carefully select a brightly packaged box filled with vivid color, tantalizing texture, and, of course, an explosion of sugar! I’m considering painting a watercolor series of old-time candies. Plus, BONUS, I get to go to the candy store and buy up some colorful treats. Right? Remember my post called Cracked Coconut? I mentioned Gummy Bears during a fruit photo shoot. 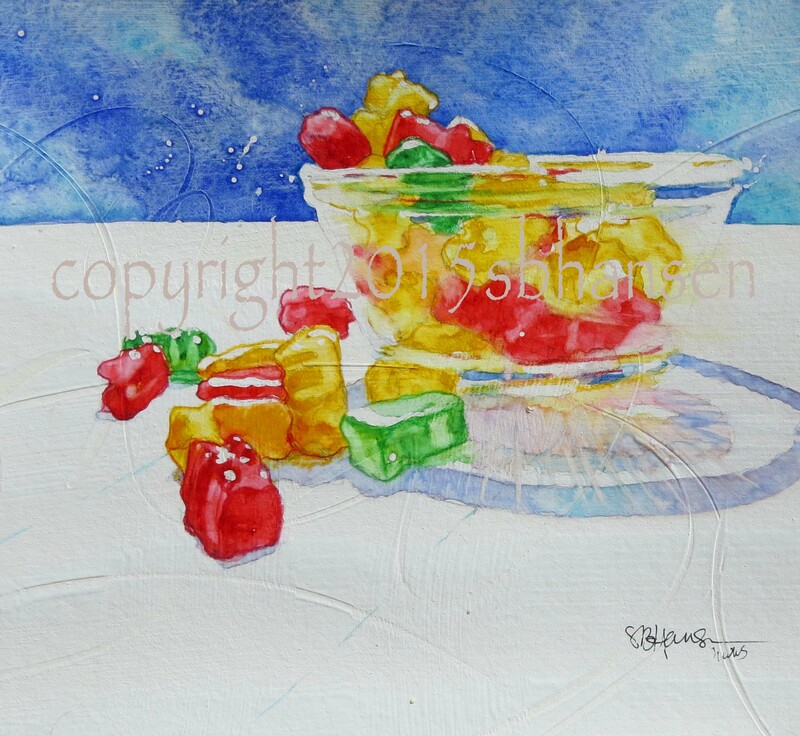 I had alluded to a Gummy Bear painting. Alas, it has come about! Very Beary was so interesting to paint! Gummy Bears? How much fun is that? Their colorful translucency with sun shining through them gave me an aesthetic fit! Oh, and during my photo shoot of the little Gummy Bears? I had to hurry. My son had quick fingers and the little guys kept disappearing. But then he came up with the title, which is perfect, so he is hereby excused from any aforementioned said consumption of gummies. Anyway, aren’t they cute? I think a series of candies would be fun and colorful. But I need suggestions. Any thoughts on candies you would love to see painted? Send me a comment (find the comment box at the very bottom of this page) to get those candies painted! To purchase, send me an comment. I accept PayPal and will email a PayPal invoice. Shipping extra. Prints available, sizes starting at 8×8 for $25. Please check back often, I’m working on an Etsy site for prints and should have it up soon. Just fantastic! I really love your style, every painting looks so unique and the techniques you use are really worth trying. Excellent artworks, all of them!